Posted September 27, 2006 in 2006/09, 8 Marvel, Assorted, Periods, Serial Posts, z Archive. If we exclude work done for the humor magazine Sick, Joe Simon’s comic book work is rather modest compared to that of Jack Kirby. Although very incomplete, the Checklist I provide is only about a couple of pages long while The Jack Kirby Checklist has 90 pages of fine print. Yes I believe some of the work in the Kirby Checklist was really done by Simon but even in my most generous estimate that still would be a miniscule fraction of Jack’s output. But to achieve correct attributions it is not enough to recognize Jack’s style, one must also be able to spot Joe’s mannerisms as well. This is particularly important because Joe frequently adopted Kirby trademarks. Because there is not that much solo Simon work I thought it would be useful to extend my previous serial blog “The Art of Joe Simon” with appendices that provide further examples of solo Simon art. Daring Adventures #12 appeared sometime in 1963. This comic title contained reprinted stories, this issue features the Phantom Lady. But even though the stories were reprints the covers were new. Although unsigned issue #12 was obviously done by Joe Simon. Joe appears to have worked on the entire cover, including designing the logo. The same logo, using different coloring, appears on issues Daring Adventures #15 and #16 for which Joe also did the cover art. The cover art is more then just a scene composition, it is a complete design. 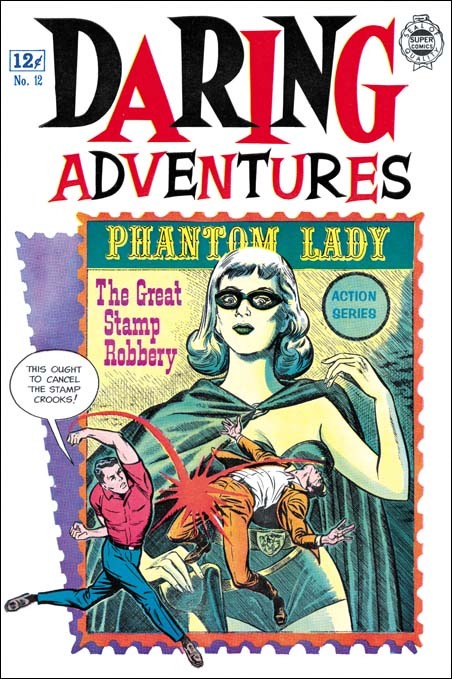 The “The Great Stamp Robbery” is introduced by placing the story title and an image of the Phantom Lady on a stamp. Included on the stamp is a caption “Action Series” in case the young readers were not familiar with this heroine. The whole stamp is made with the fine lines of zip tones and the coloring is subdued. The physically of the stamp is revealed by the lavender shadow that it casts, surprisingly on a tilted background. In front of the stamp, in bold inking and strong coloring are two figures. One, the hero, provides a solid slug to the other who falls backward. I am unclear why a male hero was used on a cover for a comic devoted to Phantom Lady. Giving Joe’s working method and Kirby’s excelling at this sort of slugfest, one would expect that these figures were swiped from Jack. However the pose of the left figure is extreme even for Jack. A similar extremely wide stride appears on the logo to the Harvey Fighting American but that pose is given to the flying slugged figure. Since that Harvey comic was published in 1966 it does not help in providing the source for the figure on this Daring Adventures cover. I cannot provide any Kirby prototype for this example but I wonder if there truly is a single source. Perhaps this figure is a composite, the torso from a Kirby slugging figure and the legs from a running one. Therefore the left figure is quite possibly not a close swipe. The figure on the right is handled so well that although I cannot provide a source for it either I strongly suspect it was a more close swipe from Jack. The figure is falling back, away from the viewer. That manner seemed more common early in Kirby’s career so I would suspect an early source. The portrayal of the Phantom Lady is a bit stiff but otherwise this is marvelous work by Joe from a period after the Simon and Kirby breakup. The design is really well done and shows Joe has not lost his touch with this sort of approach.